Not sure how this depicts the Magician? Click here. 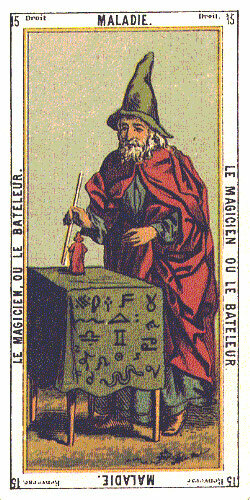 Illustration (right): The Magician or Juggler from Tarot Egyptien: Grand Jeu de lOracle des Dames (c. 1870), re-published by Editions Dusserre. Click the image for a larger one. Illustration (left): The Juggler from Antichi Tarocchi Bolognesi by Giacomo Zoni (c. 1780), re-published by Lo Scarabeo. Click the image for a larger one. Case: Though the Magician knows himself to be above nature, he understands that his operations succeed to the deree that his thought, word and action transmit faithfully the powers of the plane above him. Sadhu: For those who are acquainted with Eastern conceptions, related to the idea of this Arcanum, I can state, tha the Vedantic idea of the Atman is very close to the Man (Adam-Kadmon) symbolized on this card. ONeill: Though barely above the level of misery, the Magician represents the basic dignity and divine mission of man. Since he posseses both body and soul, he stands between the spiritual and material worlds. He carries with him the magic wand, the Caduceus, the Staff of Moses. Symbol (top): It is best viewed sideways and depicts the Magician as a bearded male wearing the conical hat of a wizard.